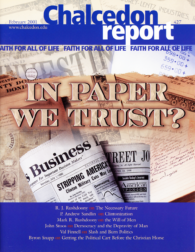 Helping Christians apply the Word of God to all | Chalcedon Foundation In Paper We Trust? This is a subject I discussed often before Chalcedon was founded, and in the early years thereafter. I then stopped because I assumed everyone knew of my view, but I find that this is not now true. Hence this brief statement. Thanks to the Constitution's 22nd Amendment, on January 20, 2001, we were spared the ongoing debauchery of arguably the most depraved and destructive United States President in recent memory, perhaps in the history of the office of the Presidency. The 2000 U. S. Presidential election will be long remembered. The scenes of lawyers, politicians, judges, and election officials debating how to interpret "the will of the people" by examining oddly marked ballots were ominous signs that reveal something disturbing about our legal system. One of the great fallacies of the modern age has been the trust in documents, contracts, by-laws, and constitutions. In the area of civil government, we can indeed say that constitutionalism marked a major advance in history, but a serious question remains. This article is not for the faint of heart, the idealistic, or the politically naïve. It will challenge your preconceived notions about the alleged "objectivity" of the American political system. Several weeks ago, while at the state capitol, I had the opportunity to observe behind-the-scene activities involving a fight for tax reduction for working class families. Frequent appeals for justice have punctuated both political commentary and man-on-the-street interviews since November 7, 2000. Why don't the wealthy give more to charity? After having worked with high income and high net-worth clients for years, our experience would conclude that there seems to be one of two possible explanations for this phenomenon.